If you’ve spent years agonising over the possibility of a live action Numskulls film — and let’s face it, who hasn’t? — you’re finally in luck. 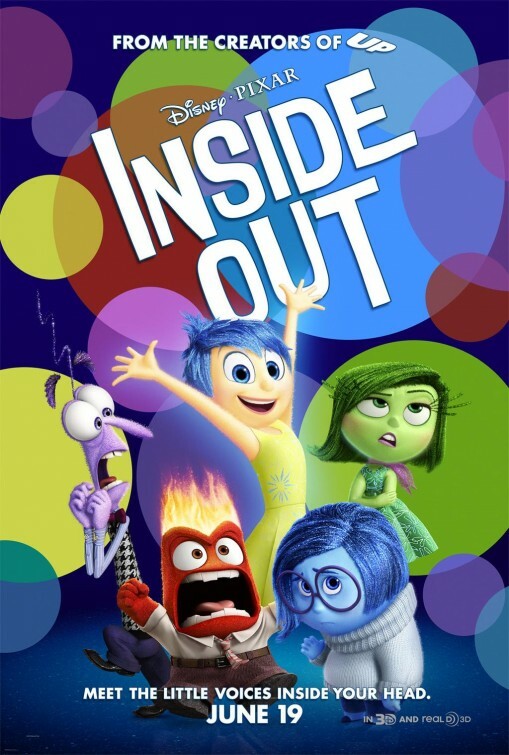 Inside Out takes the premise of said comic strip and imbues it with a visual vitality not always achievable on paper. But more than that, the film smartly and effectively explores the social complexities of growing up, and does so amidst a level of confidence not relayed from Pixar since Toy Story 3. One thing is absolutely certain: the creative minds behind the studio’s latest imagination emporium are no numbskulls. The film follows youngster Riley (Kaitlyn Dias), whose bright and bubbly exterior matches her consistently joyful interior. See, Joy (Amy Poehler) is Riley’s overriding emotion, she having commandeered a monopoly on her host’s mind since birth. A sudden shift in locale from her beloved, chilly Minnesota to an unhomely San Francisco disturbs the eleven-year-old’s mental hierarchy, leaving Anger (Lewis Black), Disgust (Mindy Kaling), and Fear (Bill Hader) in charge. As you can probably imagine, this loss of cheerful guidance sends Riley down a path of greater isolation in already isolating surroundings. Happy core memories — which power five primary islands, including Family Island and Goofball Island — are tinged with solemnity via Sadness (Phyllis Smith), whose clumsiness catapults her and Joy away from the central hub. You buy into the film’s simple story, desperately urging the odd couple back to Headquarters, even if the various structural nodes take a while to fully grasp. The inside of Riley’s head assumes a life of its own, where reality has been remodelled with a rainbow-like gloss. Fittingly, we find out it’s a movie studio (aptly called Dream Productions) that is responsible for the creation of dreams. With her rectangular hair and sharp glare, Riley’s dream auteur resembles Scarefloor clerk Roz from Monsters, Inc. Pete Docter, who helmed Mike and Sulley’s fun frightfest, also directs here and does so with incessant invention, answering questions about how the mind is constructed before we even get the chance to think them up. At one point the action calls for a dream to become a nightmare, and as such Dream Productions’ feature film evolves into a horror movie starring a huge scary clown. 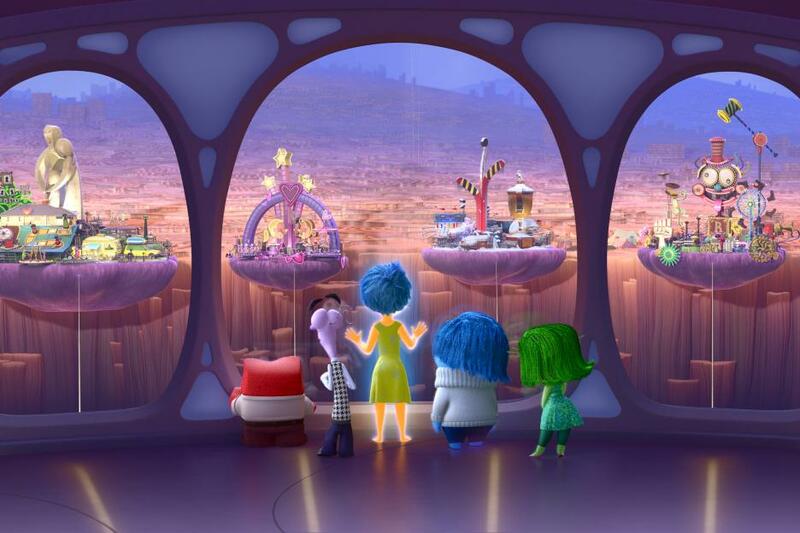 Inside Out often takes its visual cues from Toy Story, both materially and comically. Just as that franchise portrays Slinky, a stretch toy, in Sausage Dog form, here Anger wears a shirt and tie combo normally associated with workers who are fed up with their job and full of scorn. Anger is also the lead emotion inside Riley’s father’s head, a playful jab at male stereotypes; men are either grumpy, preoccupied by sports or hilariously militaristic when it comes to getting things done at the last minute. We stalk the camera during a superbly written family dinner scene as it invades the inner workings of mother and father (voiced by Diane Lane and Kyle MacLachlan), showing their respective reactions towards Riley’s morose attitude. Fear is unabashedly spontaneous, in a state of terminal alarm and never boring to watch — Bill Hader just about steals the show with his squawking audio performance. Joy glows, whereas Sadness is a murky blue colour, small and forever huddled up. Phyllis Smith’s voice work as the latter channels Saturday Night Live’s Debbie Downer to perfection. Disgust, obviously, carries the poise and style of a fashion expert. Throughout we constantly weigh up whether the emotions are controlling Riley, or if it’s Riley who is controlling her emotions. On occasion you can’t help but give into the sprightly visual splendour and the barrage of smart gags, but even in these moments the film steers well clear of all that is routine. For adults Inside Out could be a hypothetical examination of mental illness, or simply a voyage into the psychologically transformative nature of ageing. For children it’s also about growing up, only the immediacy of events on screen are sure to hit home with greater verve. The film affords young viewers an optical veracity that likely mirrors their ongoing experiences. Pixar hasn’t shied away from misfortune in the past — see the first ten minutes of Up, or the abandonment arc in Toy Story 3 — and the studio continues to respect its audience by maintaining that mature philosophy here. Joy is undoubtedly a positive influence on Riley’s life, but her mistrust of Sadness is telling. The establishment of a ‘Circle of Sadness’ is a somewhat autocratic control mechanism thought up by Joy to restrict Riley’s emotional output. Joy doesn’t want her young anchor to ail, not realising the process of ailing plays a crucial role in a person’s development. Docter and co-writers Meg LeFauve and Josh Cooley champion lightheartedness in equal measure, matching seriousness with amusement: less imperative memories are tossed away at the onset of teenagehood, at which point bouts of important knowledge (US Presidents, piano skills) succumb to materiality (the perfect boyfriend). The funniest running gag, which centres on an annoying advert with a catchy theme song, is irksomely on point. This mixture of slapstick, witty and child friendly — though not childish — comedy gives the movie a peppy air. “That’s it, I fold,” bemoans a Jelly Bean-esque builder whose house made of cards keeps collapsing. Long-term memory is visualised as a gigantic maze library. The filmmakers even explore abstract thought; the realisation of our overly analytical side (something writers can relate to), where notions and ideas and truths are deconstructed and subsequently flattened to the point of nothingness. It’s a brilliantly incisive scene that implores us not to be too self-critical or too self-diagnostic. The primary message throughout Inside Out is a reassuring one. Sometimes it’s okay to be sad. Or angry, or fearful, or disgusted. These are feelings that will eventually subside and offer in their place a stepping stone to happiness, and to other, more complex and interesting emotions. Docter’s film is rich in subtext, one of those that you should watch again and again and could pick apart all day thereafter. This warrants examination both inside and out. I’ve heard so many good things about this. I need to check it out. It’s really excellent Keith, give it a go if you get the chance. Loved the film. Really original narrative. Really got me thinking about my own life and my memories and mental make up. I’m the same. I love that, in a world where studio blockbusters dominate the summer months, it’s Pixar that’s flying the flag for properly inventive cinema (not that Marvel et al aren’t inventive — they absolutely can be — but Inside Out is on a whole other level). Great review Adam! I love this one too, a return to form from Pixar. I love how emotional this movie is, but also fun and entertaining. It’s got such a wonderful message for both kids and adults, giving us lots to ponder after we saw it, that’s for sure. P.S. Btw I just sent you a Twitter DM, would you get back to me as soon as you get a chance? Thanks! Thanks Ruth. Yep, spot on. The film manages to serve more than one customer with equal amounts of flair. Great stuff from Pixar! ‘If you’ve spent years agonising over the possibility of a live action Numskulls film — and let’s face it, who hasn’t? — you’re finally in luck. Inside Out takes the premise of said comic strip and imbues it with a visual vitality not always achievable on paper.’ – A point I’ve made in my review (posting tomorrow) but one you’ve made way more succinctly here!! Good write up mate, I enjoyed this as much as you. I promise I haven’t been spying on you Stu. 😉 The Numskulls always had me grinning when I used to buy The Beano back in the day, so it was nice seeing them realised in even more energetic and meaningful form here. Cheers mate. Haha. I used to read it in The Beezer (which probably shows my age), although I also remember them in The Dandy too. Great little strip. Adam, great post! I have every intention of buying it. Thanks Cindy — I hope you enjoy it! Great review Adam man! Hit the nail on the head! Well said buddy. Right there with you; one of my favourites of the year. Glad to hear. Superbly original and super funny too. I think it’s incredible they achieve so much without having a bad guy! Wow, great point. I hadn’t even considered that! Apologies for skipping over this review man! Just saw it. And it’s a perfectly stated reflection of a film that does so many incredible things. I like the note about the peppy atmosphere; Inside Out could have been cloying and dare I say it annoying with Joy front-and-center for the most part, but Docter et al are aware that there must be balance for a cerebral concept like this to truly work. And boy, does it. Sadness coming in and having her moment was a stroke of genius, as was the visualization of all these areas of our mind. I argued that this film is more applicable to adults rather than kids, because, even though as adults we are all still growing and learning, we’ve come through the arguably rockiest emotional stages of adolescence and childhood and can reflect back on that using this film as a filter. I think some younger audience members are going to be challenged to take this all in, especially on one sitting. But I never saw that as a disadvantage for the film. Great point Tom. I think the fact that it works on two different but equally valid levels is to the various filmmakers’ utmost credit. The complicated emotional ins and outs us adults can reflect on and ponder, and the joyous animation and self-reflection that youngsters can take in. It’s a real, real gem of a film. Top stuff from Pixar. Much appreciated as always mate!